This morning our team awoke to a beautifully and thoughtfully arranged breakfast table with a special greeting written by two crewmembers who wanted to help our team start week 2 of our mission on a high note. Each mission brings with it a unique set of challenges and rewards and I am humbled and proud to be part of such a courageous and strong team. Every morning at 08:30 we hold our Daily Planning Conference and one crewmember hosts a briefing of the upcoming EVA or team activity that will require the most coordination by all crew. We spent the mid-morning preparing for a 4-person EVA with the objective of scouting filming locations for a performing astronautics project by our Artist in Residence utilizing the Insta360 Pro camera. 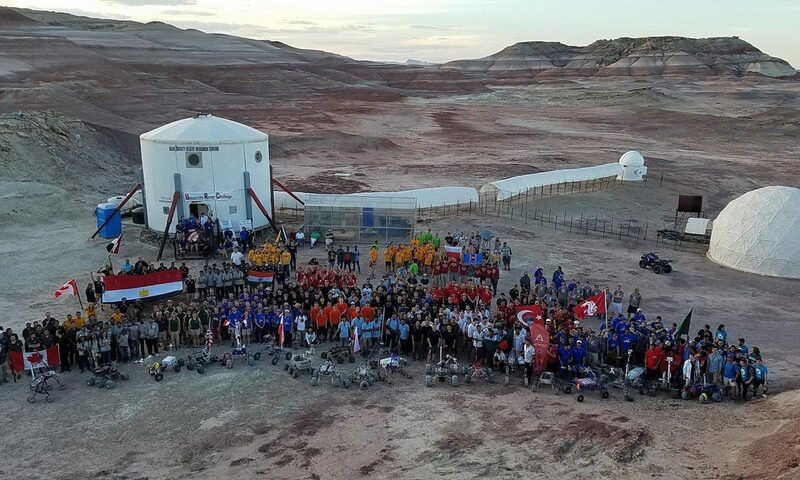 Two of our crew remained behind at the Hab to serve as HABCOM on the radio with the EVA team and keep up with science projects and tasks around the Hab. Following the EVA we shared lunch and set about working on our individual projects. We had a productive afternoon followed by a period of relaxation. Our crew is currently in good spirits and communication, stress management and team work is at an all-time high. In the evenings when our crew is not too exhausted, we have started hosting a lecture series here on Mars. After our comms window closes and our crew finishes dinner and dishes, the next scheduled crewmember to present will spend about 30-45 minutes sharing a topic that they are either passionate about or teaching a useful skill. Our crew is comprised of six individuals with strong personal and professional backgrounds that make for informative evening sessions that bond and inspire us. We will perform EVA #10 in the morning tomorrow and EVA #11 in the afternoon. Windy, but not like the high winds of yesterday. Skies were cloudy. The crew is tired but in good spirits. Two EVAs planned for tomorrow. Support Requested (acknowledged yesterday but listed as reminders): – Heater for science dome requested. – Water tank refills will be needed in the next few days.